Posted on October 19, 2014 October 19, 2014 by JumpKing Trampolines, U.S. It is fun to have a trampoline in the backyard of your home but what if when it comes to taking care and maintaining it? 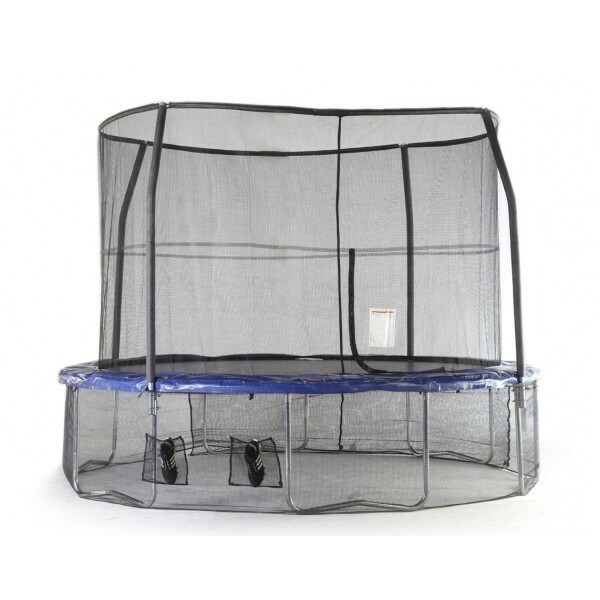 It doesn’t matter you have placed it in the backyard away from direct sunlight or left it an open space with direct sunlight, JumpKing brings you the best quality trampoline accessories that are sure to take good care at all. Having an enclosure cover is an essential accessory for a number of reasons. Apart from improving the overall look and feel of your home trampoline, enclosure cover helps you prevent from several natural forces that cause severe damage to the trampoline’s jumping surface and many other components. JumpKing Trampolines bring you the best quality of 15ft JumpPod Canopy Cover with an impressive design. Making it fully compatible with any 14ft and 15ft trampoline that has 5, 6 and 8 pole enclosure system, it protects your home trampoline from UV rays, protects it from the rain up to a greater extent, protects it from high winds with minute dust particles, delivers the extended confidence for jumping inside and enhances the overall look and feel with its impressive design and colors. Added safety features mean added time for fun on your trampoline. That’s why investing in an adjustable mesh skirt and flat step trampoline ladder are on our list. The adjustable mesh skirt with an integrated zipper (expanding to fit both the 12ft. and 14ft. models) extends your enclosure system to the ground. 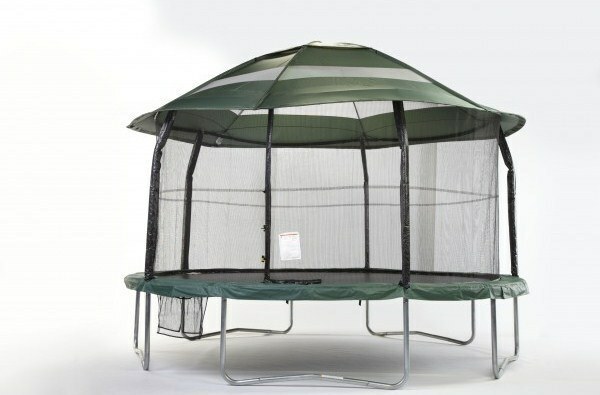 This is an added element of safety by keeping children and pets out from beneath the trampoline. Shoe pockets on the skirt provide easy storage for belongings while children are playing. The flat step trampoline ladder provides safe footing for younger kids to get in and out of the trampoline. A trampoline Anchor Kit and Weather Cover might be the two most essential accessories you can buy to ensure long-lasting enjoyment out of your investment. 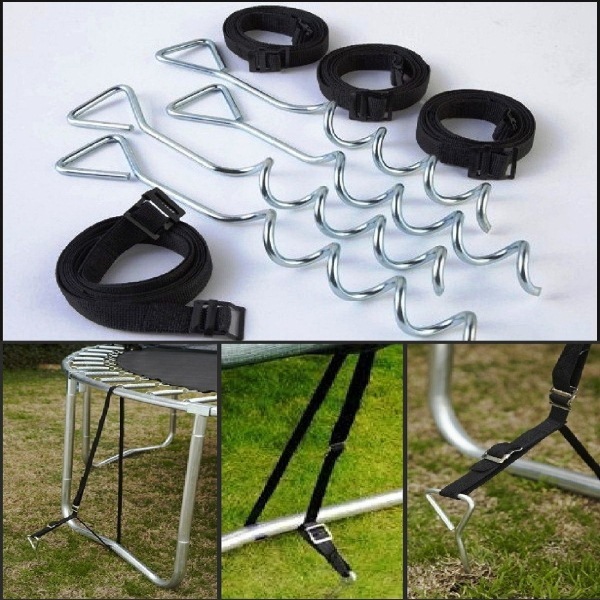 An Anchor Kit provides durable tie-downs to secure your trampoline to the ground. This helps protect it in strong winds while also keeping it stable on the ground when jumpers are inside. Other harsh environmental factors like UV rays from the sun and moisture can take a toll on your trampoline over time. A proper-fitting weather cover protects your trampoline while not in use. JumpKing offers a high quality weather cover manufactured with a premium class of polyester material for 12ft. and 15ft. trampolines. This trampoline weather cover comes with hooks that attach the V-rings below the mat’s surface for maximum coverage. Don’t worry if you have got a question regarding products you have purchased or have just ordered online on our website or need to gain more information on our free shipping policy all across the 48 continuous states. Our dedicated support team is always available for our valued customers. You may contact us directly via here.